Plot of Approx. 3.64 Acres. Landscaped Gardens, Paddock and Dell. 3 Reception Rooms & Bespoke Kitchen with Large Utility & Boot Room. 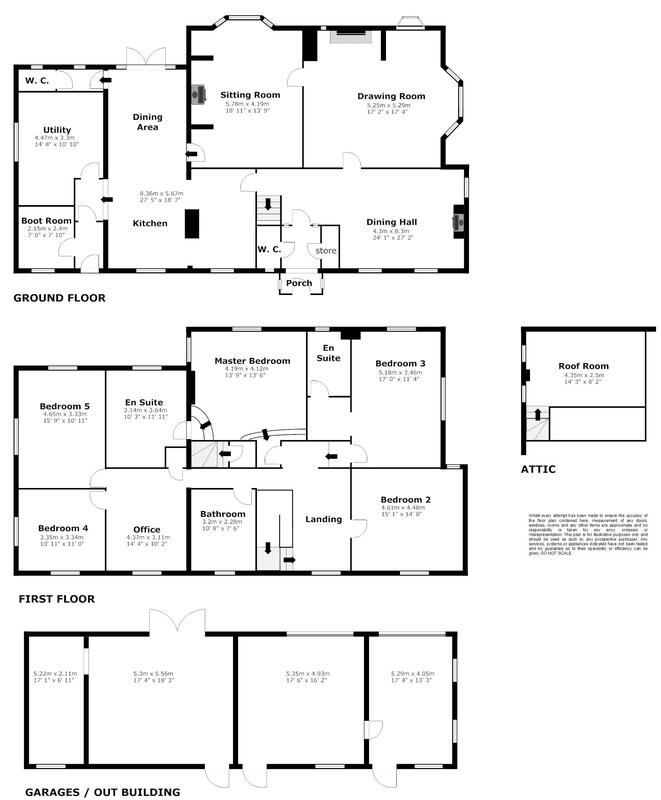 Five or 6 Double Bedrooms & Attic Room. Sandstone Barn with Triple Garage & Workshop. Tranquil Rural Location Within Easy Reach of Larger Settlements and Wider Transport Network. A stunning family home set amongst approximately 3.64 acres in one of the most picturesque spots in rural Staffordshire. Built from a combination of locally quarried sandstone, half timbering and Staffordshire red-brick infill, the attractive property sits very well in the surrounding landscape, its elevated position affording it the most wonderful views over the valley and onto farmland beyond. Greatwood is considered to have been a dwelling as early as the 16th Century with later additions in the Victorian era and the 1950s providing spacious accommodation with 5 or 6 double bedrooms depending on the buyers’ preferred configuration. The reception rooms on the ground floor comprise large entrance hall and dining hall, formal drawing room with far reaching dual aspect views, a snug or family sitting room and large kitchen with bespoke solid wood units, twin oil-fired AGA, additional electric hob, oven below and ample space for a kitchen table and chairs. Off the kitchen is a large utility room, separate cloak room and boot room. There are five or six bedrooms on the first floor set around a central galleried landing, two of which have dressing areas and en-suite shower rooms. Bedrooms four and five are off another generous room, currently being used as a home office but could give a degree of independence for teenagers or to form a separate suite of rooms. There is also a charming attic room accessed by stairs off the landing. The property is shielded from the lane by a substantial sandstone wall with wrought iron gates opening into a large gravelled courtyard to the front of the property. There is a separate large sandstone outbuilding with tiled roof a short distance away which has separate gated access from the lane, configured with three garage doors to the front, with a further workshop off. There are several areas of garden surrounding the property, each with their own distinct characteristics from the more informal area of lawn above the property, a kitchen garden, herb garden and formal parterre garden below the house with clipped box borders. The garden gently slopes away to a ha-ha, beyond which is a dell with two fresh water supplied pools and dappled shade. 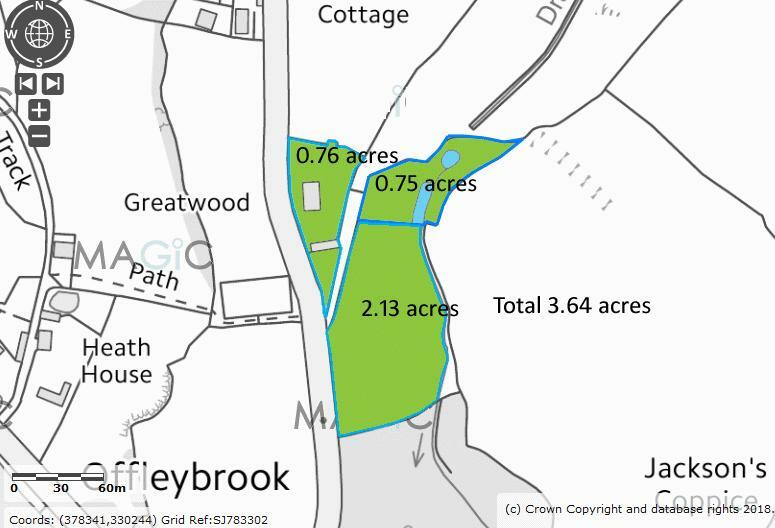 There is an additional area of paddock extending to approximately 2.1 acres with gated access from the lane and a field shelter. Offley Brook is a short distance from Eccleshall with its attractive High Street supporting a range of independent retailers. The M6 motorway at either junction 14 or 15 is within easy reach as is the county town of Stafford with a mainline railway station providing regular intercity links to London, Birmingham and Manchester. Iron gates set into a sandstone wall opening into a large, gravelled courtyard with parking for numerous vehicles. A second gate, a little further down the lane provides access to the triple garage and workshop. Exposed sandstone walls, decorative stone over fireplace with cast iron log burning stove. Hardwood flooring. Original timbers are also left exposed, giving a great sense of the history and inner structure of the home. Hardwood windows to front and side. Hardwood bay window with window seat overlooking the side aspect affording beautiful views over the garden and valley beyond. Inglenook fireplace with open fire and copper canopy. Stone hearth. Sitting room or snug 5.78x4.19m 18’11”x 13’9” into bay window. Bay window overlooking the formal parterre garden, inglenook with Clearview log burning stove, stone hearth. Parquet flooring. Bespoke solid oak units complete with integrated fridge, four ring electric hob Neff, with oven under and extraction over. Integrated dishwasher, oil fired twin oven Aga. Tiled flooring throughout. Granite work surface with twin Belfast sink. Post hatch from the external wall into the kitchen. Double doors out to stone paved terrace to the rear, enjoying the most wonderful, far reaching views. Additional ground floor WC off the breakfast area with separation by inner hallway. Functioning bell system with display panel in the kitchen thought to link property to injured servicemens’ recovery unit during Second World War. Large window to side garden, butlers sink, tiled flooring, plumbing for white goods. Rear hallway with second entrance from gravelled driveway at the front. Large boot room off with oil fired central heating boiler. Tiled flooring. Turned stairs from the hallway leading to galleried landing with window to front aspect. Dual aspect with widows to both the front and rear, original timbers, built in wardrobes. Dual aspect over side and rear, amazing views. Suite of wardrobes, shower enclosure, WC and wash hand basin in vanity unit. Dual aspect views, original timbers have been left exposed. Arch to dressing area with built in wardrobes and door to en-suite shower room with shower enclosure wash hand basin and WC. Contemporary white roll top bath with shower attachment over, separate shower enclosure, wash hand basin, WC. Heated towel rail. Dual aspect to front and side. Dual aspect to side and rear. Built in wardrobe. Attic Room 4.35x 2.50m 14’3”x 8’2” measurements taken at shoulder height. Velux roof light and three small single glazed windows in the gable end. Storage under eaves. Hatch to further loft space. Restricted height on stairs leading up to attic room. Externally, sandstone walling extending along the front boundary, with raised, well stocked and mature borders surrounding the gravelled courtyard. Steps to top lawned garden, with additional gated pedestrian access from the Lane. Seating area with stunning views over the garden and valley beyond. Vegetable garden; a charming brick folly between twin yew trees. Garden sloping gently away to a ha-ha adjacent to the footpath and down to the dell beyond. Formal herb garden leading to a second formal parterre garden adjacent to the rear elevation. Beds bounded by clipped box hedging. Oil tank supplying central heating boiler is buried in top garden. Drainage is by way of septic tank in lower field. Roller door to front, door to rear. Double doors to front, rear door. Additional area of paddock extending to approximately 2.1 acres with gated access from the lane and a three-bay field shelter.